The twenty-third episode in the series, Tintin and the Picaros (1976) is a Latin-American tale of a coup d'état, complete with hostage-taking and guerrilla warfare. Tintin returns to the country of San Theodoros, which he first visited in The Broken Ear (1937). Hergé's story reveals the hypocrisy behind the apparently endless cycle of revolution and counter-revolution in South America. Tintin and the Picaros was the last book written by Hergé, and it took more than ten years to complete. As Hergé grew older readers had to wait longer and longer between each new adventure! Tintin and the Picaros was initially going to be entitled Los Bigotoudos and then Tintin et les Bigotoudos, the word Bigotoudos coming from 'bigotudo' - moustache in Spanish. For the first frame of the book Hergé had imagined a picturesque summer scene with blossoming trees. For the first time ever, in Tintin and the Picaros Tintin sheds his plus fours and we see the little reporter wearing brown flared jeans. 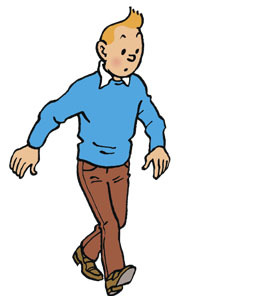 Many readers reproached Hergé for this change in Tintin's appearance - what was he thinking?! Tintin appears with a well-known logo on his helmet - the CND (Campaign for Nuclear Disarmament) sign - which during the 60s came into widespread use as a symbol of peace and love. Wearing a CND sign would be surprising for a character with apparently conservative leanings, but then is Tintin really so conservative? And in any case, people change! The CND sign was invented by British graphic designer Gerald Holtom, for a protest against a nuclear armament factory in 1958. This story of Tintin and the Picaros is all about change. It looks like Captain Haddock has lost his taste for whisky, and he also seems to have calmed down a little. The Captain barely utters a single curse throughout the adventure - what on earth is going on?! Archibald: who would have guessed? We had to wait until the twenty-third adventure in the series to discover Captain Haddock's first name, which is mentioned during a surreal moment when Tintin reminds the disorientated Captain of his first name and surname. Hergé wrote 17 first names down on a piece of paper, which is on display at the Hergé Museum. In the end he chose Archibald over Marmaduke. In Tintin and the Picaros we see a different side to Nestor, who is normally impeccably behaved. The straight-laced butler develops a taste for alcohol: like master like servant. Nestor also shows an indiscreet streak, secretly listening in on conversations, and is acutely embarrassed when caught in the act by Captain Haddock. This is the last time in The Adventures of Tintin that we see the butler from Marlinspike Hall, although a few sketches of Nestor do appear in Tintin and Alph-Art. Snowy senses an unacceptable intrusion into his territory. Has his master taken a shine to the cat at Marlinspike Hall? In this light perhaps the fact that Snowy still seems to have a weak spot for alcohol and drunken antics, can be forgiven. Tintin never travels to Mexico, but while sketching the pyramid in Tintin and the Picaros, Hergé drew inspiration from a Mayan pyramid found in Yucatan, South Mexico. The Mayan pyramid is called El Castillo de Kukulcan. Standing 30 metres tall, it towers over the vast Chichen Itza archaeological site. The last complete Tintin adventure unfolds in the imaginary South American state of San Theodoros. While Hergé based his made-up country on real life, the author completed the picture by using his imagination to fill the gaps in his knowledge. Hergé dreamed up a carnival troupe named the Jolly Follies. Hergé's archives include photos and articles about carnival processions, and the author was partially inspired by the famous group of revellers, the orange-throwing Gilles of Binche. In real life, Fidel Castro also profited from carnival celebrations to launch an attack (26 July 1953) on the Moncada Barracks in Cuba, an event widely recognised as the beginning of the Cuban Revolution, which would finally topple the dictatorship of Batista in 1959. A final amusing detail about the Jolly Follies: a group called the Turlurons (Jolly Follies) has existed in Louvain-la-Neuve (the location of the Hergé Museum) since 1991! Characters disguised as Asterix (Goscinny and Uderzo would return the compliment when the Thom(p)sons appeared in Asterix and the Belgians), Snoopy, Donald Duck and Mickey Mouse, appear on page 54. It's a shame Herge backed off an adventure in Sydney / Australia, because instead we get another South American episode with political themes already dealt with. A number of characters are also recycled, a habit Herge overworked in later years. Calculus' anti-alcohol drug was a clever plot device, but ultimately the story seems to be stuffed with a lot of predictable filler. Alcazar would never have been the subject of this album if Herge would have known it would be the last he publishes. Not the best ever but still enjoyable .